VISIT PARIS AND ENJOY AN EXPERIENCE THAT WILL TAKE YOUR BREATH AWAY! Easter Garden from April 18th to May 5th! [Past event] The highest ice rink in Paris ! [past event] A totally new activity in Paris: a 210 m high ball pit! [past event] TOP JUMP PARIS – TRAMPOLINING AT 210M! A legendary neighbourhood, an ambitious project, and four years of construction, Montparnasse Tower has a fascinating history. First Germans and Russians, then Americans. The 1929 Wall Street Crash brought curious people, who came to dance at le Bal Nègre or at le Jockey. The Roaring Twenties may be over, but today Montparnasse has regained the vitality of its old days, at any hour of the day. The story of Montparnasse Tower began in 1934 when the SNCF, the French rail company, decided that the Gare Montparnasse train station no longer met its needs. After 25 years, the reconstruction project resulted in a large-scale urban renewal project; the train station would be moved and the newly-freed up land would be used for new purposes. In 1959, the first studies for Montparnasse Tower were conducted, and the historic project was criticised for its height, and met with roadblocks. The winning project, designed between June 1966 and spring 1969, brought together four architects: Urbain Cassan, Eugène Beaudouin, Louis de Hoÿm de Marien, with help from architect Jean Saubot. In 1968, Minister of Culture André Malraux granted the building permit. 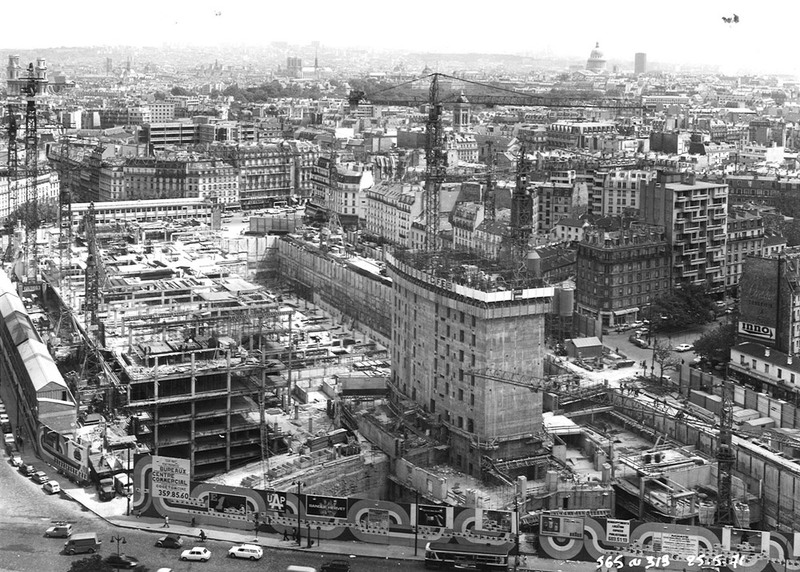 In 1969, French President Georges Pompidou, looking to modernize the capital’s infrastructures, approved the construction of a truly modern urban development complete with a shopping centre. Construction could then begin on Montparnasse Tower. In April 1970 lthe first stone was laid. The first step of the project was removing 420,000 m3 of rubble. For urban planning reasons, Montparnasse Tower needed to be constructed right over the metro (underground), which needed to be protected by a reinforced-concrete shell. In October 1970 the foundations were completed. In March 1972, the highest point of the tower reached 200 metres and 57 storeys. In December 1972 the tower grew another 9 metres when a radio wave relay station and a heliport were installed on what would later become the Montparnasse Tower Terrace. After nearly four years of construction, Montparnasse Tower was inaugurated on 18 June 1973. So begins the story of the only skyscraper in Paris. A BREATHTAKING EXPERIENCE…AND NO NEED TO QUEUE! BRENG EEN ADEMBENEMEND BEZOEK… NU! WACHT NIET LANGER VOOR EEN ADEMBENEMEND BEZOEK! Een ongekende activiteit in Parijs: een ballenbak op 210 meter hoogte! Uw verrassende activiteit in Parijs: een ballenbad op 210 m! The Regional Tourism Committee (CRT) is an organisation associated with the Ile-de-France region that promotes and provides information about activities in the Paris/Ile-de-France area and helps carry out tasks that contribute to the implementation of the regional tourism policy. To welcome and inform visitors: Lovers of the capital, six offices welcome you year-round. To promote the destination in France and abroad: The Bureau actively promotes everything Paris has to offer recreational and business tourists through travel agents and the media. The French Tourism Development Agency. Atout France is the French government's sole tourism operator. The law of 22 July 2009 regarding the development and modernisation of tourist services tasked it with promoting the development of tourism and all the actors involved with this sector. The World Federation of Great Towers is an international association of organisations that manage high rise towers, on the condition that they are open to the public and constitute a tourist attraction. National Union of Leisure, Amusement and Cultural Parks. The SNELAC is a professional and employers’ association open to all family-friendly recreational sites that are in an enclosed and developed space. As such, amusement parks, water parks and wildlife parks, theme parks and parks with a scientific function, cultural sites and natural sites have become members in order to promote their activities. Le Ciel de Paris: the gourmet panoramic restaurant in Montparnasse Tower, the highest restaurant in Europe! A breathtaking view of the Capital that brings about a sense of tranquillity and bliss. Its luxurious décor and modern style give it an elegant atmosphere. Accor, the top hotel operator in the world, has put its trust in Montparnasse 56. Europe's leader, the group has nearly 3,500 hotels with 450,000 rooms in 92 countries. Public transport in the Ile de France region Look up routes, maps for the metro, bus, RER (regional commuter train), and the neighbourhoods, as well as information about traffic, prices, timetables, accessibility, etc. The Paris Visite travel card is valid for 1, 2, 3, or 5 consecutive days in zones 1-3 or 1-5. Paris Visite also gives you benefits and discounts at 13 of the RATP's partners. Cultival is an agency that organises cultural tours and offers guided group tours of the Montparnasse Tower panoramic observation deck.